As Christmastime approaches in New Orleans, the city gears up for all of its annual traditions. There is the big Christmas parade and caroling at Jackson Square. Some even take trips to the bayou country to see the lighting of the bonfires that guide a special visitor to the homes of Louisiana on Christmas Eve. If some of these traditions sound a little out of the ordinary, then you are right along with New Orleans’ newest resident, Jenny Giraffe. Hardcover. In Jenny Giraffe Discovers the French Quarter, Jenny finds a place to fit in. “Run, Jenny, don’t let them take you to the zoo! Find a new home!” urged Jenny Giraffe’s mother after the door to their truck popped open. 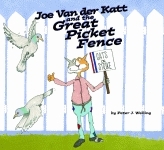 Afraid of life in the zoo, the little giraffe did as her mother said, slipping through an open gate into a beautiful French Quarter courtyard. 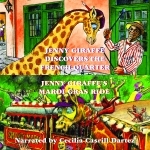 In Jenny Giraffe’s Mardi Gras Ride, Jenny Giraffe learns all there is to know about Mardi Gras. In Jenny Giraffe Discovers the French Quarter, Jenny finds a place to fit in. “Run, Jenny, quickly! Don’t let them take you to the zoo! Find a new home, my dear!” urged Jenny Giraffe’s mother after the door to their truck popped open during a minor accident on the streets of the French Quarter. Afraid of life in the zoo, the little giraffe did as her mother said, running down the narrow streets and slipping through an open gate into a beautiful courtyard. A prolific book and magazine illustrator of the early 20th century, Smith is best known for her illustrations of Good Housekeeping covers for more than 15 years during the post-World War I era. This pictorial volume also details the life and influences of this famed illustrator. Hardcover. Josh’s little sister Callie is probably the sweetest girl in the whole county, but no one loves her more than her big brother. When Josh finds a giant pumpkin on Grandpa Frank’s farm, the two agree to keep it a secret from Grandpa’s prospective buyers. It is the biggest pumpkin that Callie has ever seen, and Josh tells the four year old stories about magic pumpkins. With such a big pumpkin, Josh will surely be crowned Harvest Festival King and get to ride in the biggest float in the parade. The queen of gospel and a symbol of integrity, Mahalia Jackson was the embodiment of an era. Accurate, well-researched, and rich with the music, faith, people, and events that sparked the spirit of the time, Just Mahalia, Baby is a fast-paced and engaging biography. Paperback. They say every Derby has its story. It could be a remarkable trainer, a last-place finish for a first-place horse, or a newfound overseas interest in the race. Whatever the subject, the legends and history of each year’s run create the enthusiasm and drive that bring thousands back time and time again. And just like its counterparts—the Super Bowl, the World Series, and the Indy 500—there are legends and stories to be told that exemplify the fervor that begins in Louisville nearly a whole month before the race. No fictional swashbuckler could ever rival Jean Lafitte’s dramatic life. From his hidden base in the Louisiana swamps at Barataria Bay, Lafitte mounted daring raids on ships in the Gulf of Mexico. His battles with the law were the stuff of legend: when Governor Claiborne of Louisiana offered a reward for the buccaneer’s capture, Lafitte responded with a bigger reward for the governor! But when the British asked for his help in their invasion of Louisiana during the War of 1812, the pirate instead joined forces with Andrew Jackson to win the Battle of New Orleans. Paperback.